AT&T to add unlimited Mobile to Any Mobile calling February 10th (Updated 2x) | When Will Apple? UPDATE Ars Technica confirmed with AT&T spokesperson Seth Bloom, the qualifying voice plans include Nation 450 and 900, or FamilyTalk 700 or higher. Looks like AT&T is getting a bit more nervous about losing its precious iPhone subscribers, with their above average monthly bills, to Verizon. 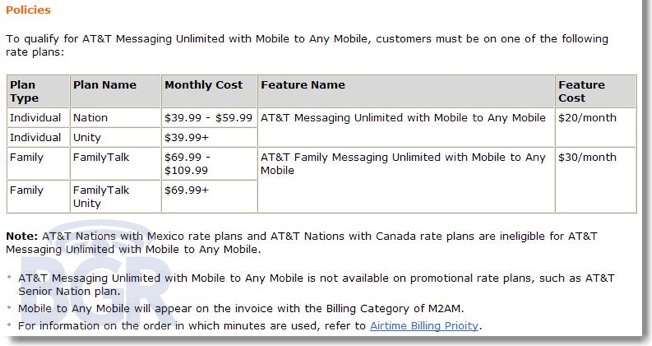 According to AT&T, unlimited calling to any mobile number is available to customers with an unlimited messaging plan and a qualifying voice plan. You’ll have to check to see if your current voice plan is supported for the new feature.